From the lift06 blogject crew: "A day in the life of my flickr networked camera"
The first project wondered how to design a camera Blogject. They came up with the idea of a digital camera which has its own Flickr account and has context-aware capabilities; for instance it has a GPS that makes it trackable: it can be googled by the user and hence located. The user gets the camera which already has a flick account, from inside the packaging, just waiting somebody to buy it. This camera is just like other social beings, communicate with other Blogjects, so when it's in a particular environment, it can develop a sense of its context by communicating by each others' objects. It knows what other Blogjects are around and then takes pictures on it own. The group thought about a potential scenario of a birthday parts. The camera is with its owner when he's going to a birthday party; of course there are other camera there too and the Blogject can communicate and help establishing context with the others. For instance, this camera can communicate with the other cameras and then link-up these other flickr stream ("oh it's cool you also have a flickr stream"), to share images. It might even find out that situation is relevant or not to be uploaded (and tagged) on a flickr set about this peculiar event. In addition, the camera is context-aware: since it can detect the presence and the proximity of other devices, it pulls content on the blog meaningfully; by googling where it is and then pulling content or also linking to other contents (similar or not). Since the great thing of blogging is not putting up some content and stepping away but rather circulating ideas and meaning, this camera would need to be able to do that: finding other relevant content, and also finding content unrelated to camera (e.g. newspaper) to create relationship between semantically similar data to increase the meanings a single image could have. From my former Nomadic Computing research group at HP Labs: "Creating and Experiencing Ubimedia"
Out to dinner with co-workers and colleagues, John takes out his "multicorder", a ubimedia player based on a cell-phone and camera with sensors for global position and identification tags. Getting everyone's attention he photographs the diners and then passes the device around for everyone to "sign". As people look at the photo, some of them pass their business cards over the ID sensor. Others use their cell-phones to signal John's phone with their names. When the device returns to John, he presses the "send" button and uploads the data to his web site. 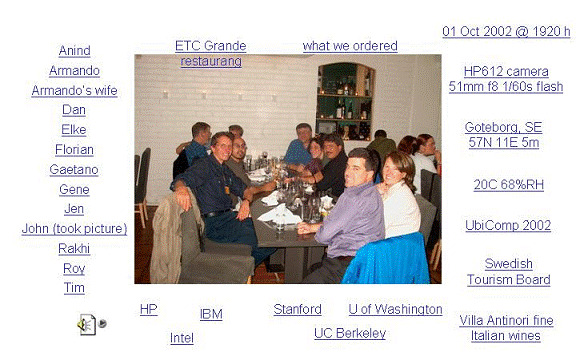 His site augments the data with coincidental information, linking in information about the site of the dinner, other pictures John took, and the conference he was attending. The result is an image as shown in Fig. 1 and a set of links, some of them bound to the picture and others bound to the restaurant and the people in the image. Figure 1. What do you get when you take a ubi-picture? Cool shock of recognition, similar in so many ways except we didn't have flickr yet. I need one of those camera blogjects so I can make ubiphotos. Yes, definitely. Thanks for the link to the HP research article! You might be interested in my research (beta) project, Toupix. It is a mobile camera & Web app that tags photos with who was nearby when the shot is taken. Once uploaded to the site, photos (or, specifically, events) can be navigated through their social context.